William Heinemann, 1952, Hardback in Dust Wrapper. Condition: Very Good — in Very Good Dust Wrapper. Dust wrapper a little faded. Price Clipped. Edges of the text block lightly spotted. Tanning to the blanks and pastedowns. Portraiture frontispiece. Illustrated with black and white photographs. From the cover: “Cecil Sharpley was for fourteen years a member of the Australian Communist Party. When he walked out three years ago, he had risen to be one of the inner circle of party bosses who, in Australia as elsewhere, direct Communist activities, and, on behalf of the Cominform, lay down the ‘line’. In The Great Delusion he describes how he came to find himself in this situation, and how, after much heart-searching and long hesitation, he decided to break with the party and tell the world about its methods and true objectives. It is a sober, sincere, factual narrative, written without bitterness, and agreeably devoid of self-dramatisation. 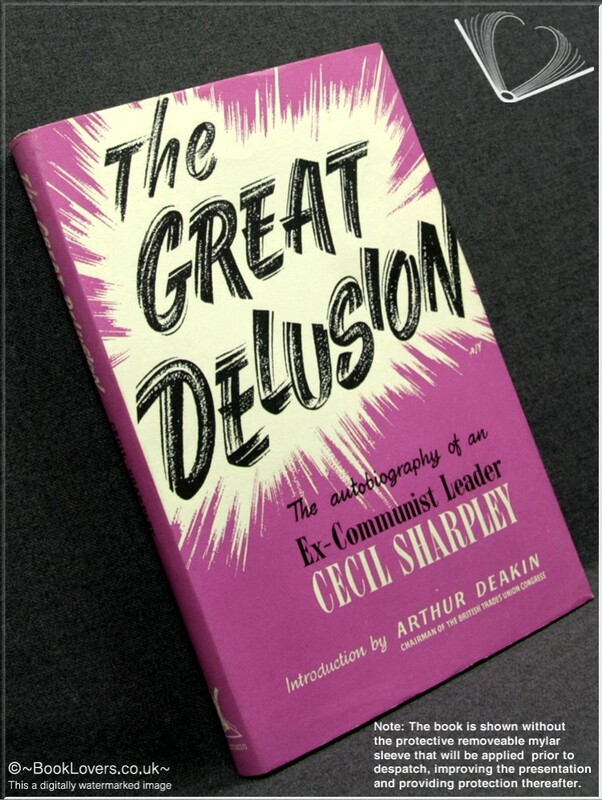 The large and varied literature of Communist disillusionment has been produced, for the most part, by intellectuals and ideologues. Sharpley is in a quite different category. His experience was gained in the rough and tumble of industrial action. He was concerned with trade unionists, not surrealists. It is this which makes his testi mony of such outstanding value. Communists may flourish Picasso’s dove, but their chief objective is, and has always been, penetration of the trade unions. Sharpley shows, as no one else ever has, how they set about this; how they use both terrorism and chicanery to achieve their purpose; how they stick at nothing, not even at ballot-rigging, of which he provides a fascinating, detailed account. Foreword or introduction by Arthur Deakin. Size: 8" x 5¼". Black boards with Gilt titling to the Spine. [XII] 155 pages.